Knott’s Berry Farm debuted the newly improved Calico Mine Train this morning and I was thrilled to take a ride. Yee-haw! What an adventure – that little railroad is as sweet as Cordelia Knott’s boysenberry pie. Even with a dramatic renovation that dug deep into the 54-year old mountain, replacing all the ancient works with hidden tech, the enhanced theming department at Knott’s did a tremendous job rebuilding the classic dark ride while keeping the mood intact. Like all good restorations, that work is invisible behind new scenes that feel more alive and authentic than ever. Walter Knott loved the desert ghost town of Calico so much he bought it in the 1950s and made it into a roadside attraction. Back in Buena Park, every robot miner has dramatically come to life, and every color is brighter and more intense. You can finally see all 8000 stalactites and stalagmites and hear their lovely organ song. Steam and explosions and bubbling water engage all the senses. The glory hole has never been more glorious. The whole park seems to be heading back to its rural roots. New trails, splashier waterfalls, and barrels of cactus go a long way towards the suspension of disbelief and help put you in the imaginary Old West town of Walter Knott’s dreams. The Camp Snoopy theming is so extreme that Snoopy himself will come tuck you into bed in special rooms at the refurbished Hotel. 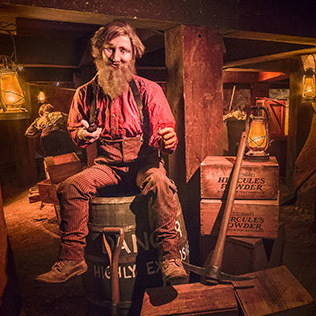 That might be a little much, but I’m elated that Knott’s has finally seen the light and invested in renewing the classic attractions (the Timber Mountain Log Ride was rehabbed last year), enhancing their art department, and even snagging Krazy Kirk and the Hillbillies from their competition in Anaheim. Here’s hoping next year brings a waxed moustache melodrama to the Bird Cage Theater. Previous articleGreat Places to Watch the World Cup in L.A.